Manchester City Council is very good at making promises. 18 months ago they promised a $14.5m “Clean City Fund” from an airport windfall. There was lots of coverage about the scheme being set up. Not so much about precisely how all the money was being spent. 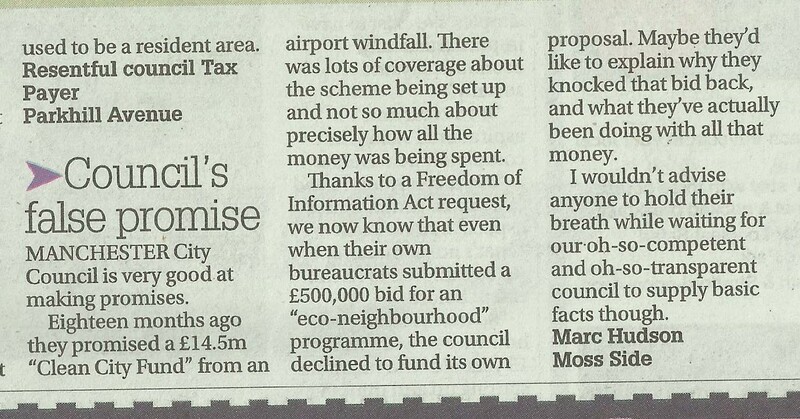 Thanks to a Freedom of Information Act request we now know that even when their own bureaucrats submitted a $500,000 bid for an “Eco-neighbourhoods” programme, the Council … declined to fund its own proposal. Maybe they’d like to explain why they knocked that bid back, and what they’ve actually been doing with all that money. I wouldn’t advise anyone to hold their breath while waiting for our oh-so-competent and oh-so-transparent Council to supply basic facts though. This entry was posted in Manchester City Council and tagged Eco-Neighbourhoods. Bookmark the permalink. Hi Marc, spotted your letter in today’s MEN, a good day to get it in. Though the actual readership of the MEN, on Thursday and Friday, when it is free. As many copies go in the recycling bin, to full the advertisers, there is a larger readership. Have you had any feed-back from it yet? Our Cllrs (Withington) suddenly running around doing Eco projects in run up to election and ignoring long term hard work of local volunteers to improve neighbourhood, taking credit to make their political CV look good. Need some honest cllrs in Manchester. Funny how they’re all suddenly interested in climate change to tick a few election boxes. They are a joke. They are a sick joke. They are totally unwilling to hold their officers and Executive to account for years and years of incompetence and broken promises. Why? Some too stupid and lazy. Others too cowardly – want to climb the greasy pole. They make me want to vomit, basically.